The impact of the natural environment on human health has been a subject of study in China for at least 5,000 years. 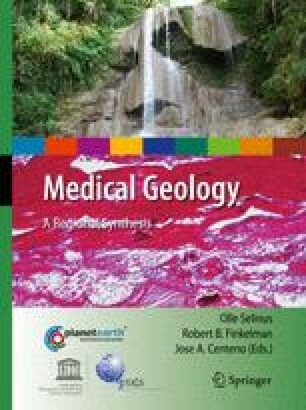 China’s varied geology and geography and its large population living off the land have resulted in the presence of virtually every known environmental health problem and some of the most serious medical geology problems. Fluorosis in China has been caused by drinking fluoride-rich waters, burning coal briquettes using fluorine-rich clay binders, and eating high-fluorine salt. Iodine deficiency disorders such as goiter and cretinism were common in central China but the introduction of iodized salt has greatly reduced these health problems. Arsenic poisoning has been widespread in China, mainly caused by drinking arsenic-rich groundwater but burning arsenic-rich coals and metal mining have also contributed to this problem. Selenium deficiency that is believed to be a causative factor in Keshan disease and Kashin-Beck disease was widespread in a zone from northeast China to Tibet. Human selenosis, thallium poisoning, and various respiratory problems caused by exposure to minerals have also been reported from China.